One or more of the given URLs is not permitted by the App's settings. It must match the Website URL or Canvas URL, or the domain must be a subdomain of one of the App's domains. Not a good way to start a weekend, I can tell you. Then I decided to employ the ‘wisdom of the crowd’, aka twitter. My fellow MVP András Vélvart responded immediately by acknowledging he had the same problem, and pointed me to this Facebook bug report. I hadn’t messed anything up, neither had Melvin. Facebook itself had pulled the rug from under us. Now at the point of this writing I have ascertained Facebook apparently have fixed the error, but that was not the case yesterday and with a deadline looming I needed a plan B very quickly, and I got one with the help of Tamás Deme, aka 'tomzorz', a Hungarian Windows Phone consumer MVP that I did not knew nor followed yet (shame on me!). Although the ‘normal’ way now works again, I decided to blog about the alternative approach anyway, to make sure this plan B is available to everyone in case, ehm … excrement hits the cooling device … again. 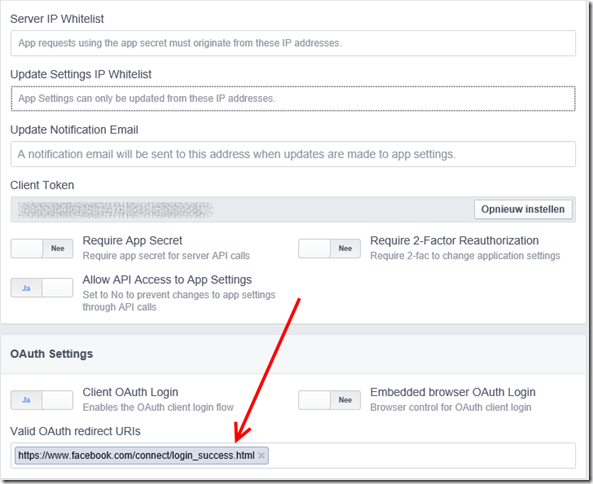 You get the callback URL to your own app, create a login Url, ask the WebAuthenticationBroker to do it’s stuff and show the “connecting to a service” window with the Facebook login, you parse the result, and if all goes well, you have a token. All code sits in the code behind – this was a POC, so that is very much OK. This looks very much the same, except that I have replaced both the AuthenticateFacebookAsync and the ParseAuthenticationResult methods. A lot of it is just setting up a UI of a popup with a WebView, then navigating to the Facebook authentication url. This will show a ‘normal’ web Facebook login (without the “Connecting to service” header). The interesting part I annotated in red and bold – when this event handler detects either “access_token” or “error=access_denied” in the url it’s navigated to, it considers it’s work done. Facebook navigates to a page with an url that either contains one of these strings, and we have a token again. Or not. 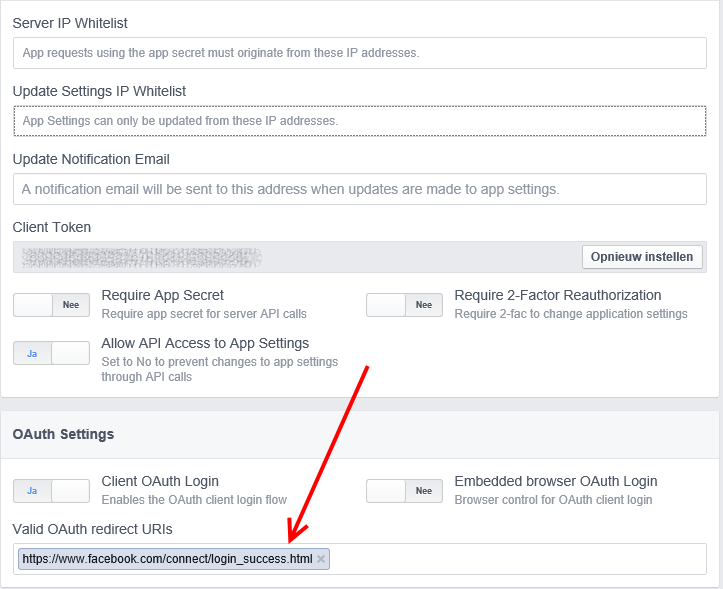 To get this to work, you will have to add in your Facebook app settings (on Facebook developer) under section “Settings/Advanced” the return url to whatever you decided to use for the Facebook success url ( see FbSuccess constant). As always you can find a ready to run demo on GitHub although in this case ‘ready to run’ is stretching it a little, as you will need to define an app in Facebook developer to get this actually working. 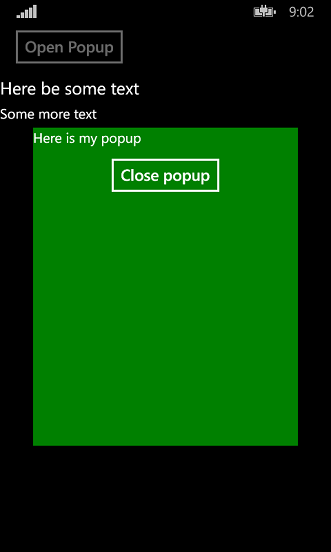 And a great big of thanks to my colleague and the awesome #wpdev community for getting this to work. This is quite a standard way to set up a Xamarin Forms application using a XAML-based start page. I did not make it up myself ;) . A behavior in Xamarin.Forms has two events you can trap – OnAttachedTo and OnDetachingFrom – by basically overriding the methods with that name. But those are fired apparently before the visual element to which the behavior is attached to is loaded and made part of a layout: the attached object has no size, and no parent. To make matters more complicated, there is also no OnLoaded event on the attached object, like in WinRT XAML. So when do you know when the layout is ready? and then a base class implementing that interface. This is not strictly necessary, but I always feel compelled to make a base class for convenience, yet I don’t want to force myself or my fellow developers into always needing to use that base class. The interface allows me an escape route out of a possible undesirable inheritance kludge. I think that’s just good architecture. And there we see the familiar MVVMLight syntax again. So great if you can use an awesome friend from the Windows ecosystem in a cross platform setting again (thanks Laurent!). In every page you make using this behavior then needs to have this kind of plumbing. Of course, you can define a nice base class for this as well, making the last three methods disappear again. Have a blast. I only have one page in this solution, so I leave it at this. The important thing is – we have now a way to pass the fact that the view is ready to the view model, a behavior can bind to this, and things can happen in the right order. Nothing special here – standard MVVMLight view model and syntax. This basically sets up the behavior, keeping a reference to the object it’s bound to. In the OnAttachedTo there is an odd piece of code. Basically, if you don’t use this, binding to the Bindable Properties that I will show later on will not work. I have no idea why this is. It took me quite some nosing around in the Xamarin forums and eventually I found this solution here in this thread. I am not sure if this is a recommendable way. But it seems to work. Like Attached Dependecy Properties in Windows this is quite some code, a lot hinges on connecting the dots in the right way, and a part of it depends on naming conventions. To make life easier, I made a Visual Studio snippet for that. The whole purpose of this construct is to make sure the AnimatePopup method gets called with the right parameter whenever the bound property changes. This sets the width of the popup to 0.8 times that of the parent view, it’s height to 0 and it’s visibility to false, effectively creating an invisible pane. It also calculates the height to which the panel should be unfolded, that is, when it is unfolded – 0.6 times the height of the parent. Mind you, these values are now constants, but could just as well be properties as well, with values you could set from XAML - thus creating a more customizable experience. If the popup should be displayed (triggered by the change on the IsPopupDisplayed property) it first sets the popup’s visibility to true (although it’s still effectively invisible, as it has zero height) and then it launches an animation that goes from 0 to the unfoldingHeight in about 750ms. The Animate method then creates the actual animation, that animates the HeightRequest using and easing method (also a familiar friend from our good old Storyboards). By calling the Commit on it, you actually launch the animation, and you can apparently also make some kind of callback running when the animation is finished – in this case, when it determines the height is 0 (thus the popup has been folding in) – it should make it invisible again. Take note that the folding back goes a bit faster than the unfolding – 500ms in stead of 750ms. They could be the same, of course. It’s just a nice touch. <Button Text="Open Popup" HorizontalOptions="Center" VerticalOptions="Start"
Warning – you mileage may vary with this approach. I am not very versed in Xamarin Forms yet and I have no idea what amount of rules I am now violating. I find the hack in OnAttachedTo a bit worrisome, and I wonder if is has side effects. In addition, Xamarin Forms is a very rapidly evolving platform so anything I write today may be obsolete tomorrow. Also, this behavior does not yet take into account any changes in screen size (or rotation) that may occur after the behavior is initialized. I don’t doubt though this could be added. With this article I hope I have given you some thought about how to write reusable x-plat animation blocks that can be wired together using behaviors. I still think it’s very important to keep such stuff from code behind as much as possible (although never loosing track of practicality – if some effect can be created using two lines of code behind, it’s not very smart to write a bazillion lines of code just to avoid that). What is sorely missed in this environment is my old friend Blend, which in a Windows environment can be used to drag behaviors on top of elements and wire some properties together in a simple UI. In Xamarin, it’s hand coding XAML all the way. Still, it’s an improvement over putting all this stuff in code behind. As usual, a sample solution can be found on GitHub. This includes the snippet for creating Bindable Properties. I want to thank two of my fellow developers colleagues at Wortell for being an inspiration to this blog post: Bruce Wilkins for showing me the two events that occur when a Xamarin Forms page loads and unloads, and Edwin van Manen for showing me the Xamarin Forms animation basics. They made me understand some parts that I needed to connect the dots and make this technique work.